Jeremy grew up in the northern NSW coastal town of Kingscliff before moving to Sydney when he finished school to attend Alexander Mackie Art School. Within that first year, he dropped out of art school to play music full time, forming Sunnyboys with his brother Peter, school friend Bil Bilson and Richard Burgman. Sunnyboys enjoyed rapid success with hits 'Happy Man' and 'Alone With You' from their debut album, which quickly went 'gold'. The band toured relentlessly and put out three albums until the band's sudden demise following Jeremy's diagnosis with schizophrenia at 22. For the next ten years, Jeremy lived in Sydney, dabbling in music, trying to keep busy, but was plagued by the crippling effects of his illness. In the mid 1990s he moved to the country to enjoy a quieter life and began painting prolifically. In 2008, he met Mary, who helped him become successfully medicated for the first time and he slowly rebuilt his life. In 2011, the couple married. In 2012, the original band reformed and have been enjoying great success once again. Mary was born in Brisbane. On finishing school, she trained and qualified as a registered nurse before relocating to Redlands south of Brisbane enjoying many roles in nursing. Mary married local ambulance identity John 'Griffo' Griffiths in 1994 and had twins Lachlan and Kieran in 1998. Sadly, Griffo passed away in 2003 from an aggressive brain tumour. Mary continued on with her career and as a dedicated mother to her young boys. In 2008, she met Jeremy Oxley. The couple fell in love and with Mary's guidance, embarked on the lengthy journey to rebuild Jeremy's life and the start of their active and creative life together. In 2011, the couple featured, along with Jeremy's brother Peter, in the documentary 'The Sunnyboy' directed by Kaye Harrison about Jeremy's struggle with schizophrenia. Since the film launch in 2013, Mary has made over 20 appearances as a guest speaker and is an active advocate for Mental Health reform. 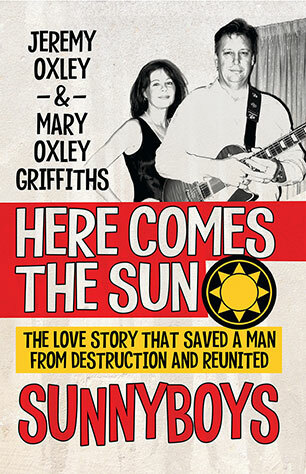 An inspirational and heart-wrenching memoir of fame, schizophrenia, struggle and love by Sunnyboys frontman Jeremy Oxley and his wife Mary Oxley Griffiths.